Sunday afternoon at Meiling Market in Singapore and the hawker center is bustling. Amid the hubbub and the action-packed food stalls, there is an alluring energy: The place is simply brimming with possibilities for the brunch ahead of us. There’s the shredded chicken noodle shop round the corner, or perhaps a spot of hearty duck rice. I’m sometimes at a loss when I come here — it’s not a market I know well (yet) and my first response is often bewilderment. I can’t decide because I simply want to eat everything. Well, the sampling of every dish here could possibly be accomplished, but that’s got to start somewhere. 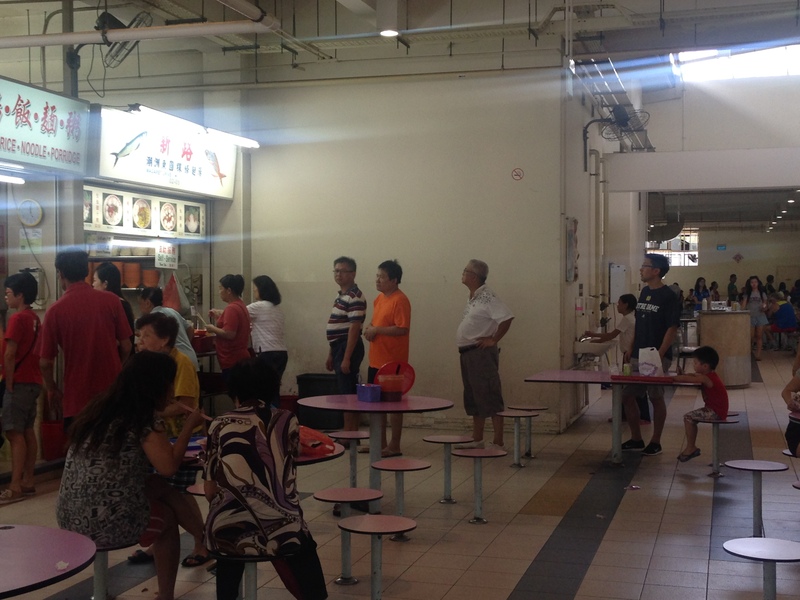 Today, my father has a few wise words: Go to the fishball noodle stall with the long queue, he says. It’s very good. It’s not hard to miss the stall my dad speaks of — the words on the signboard are all in Chinese, except for “Margaret Drive,” the road this noodle shop used to be on before relocating to Meiling Market. Although the line’s fairly long, it moves fast — and the noodle lady is super efficient, taking your order the moment you get in line. 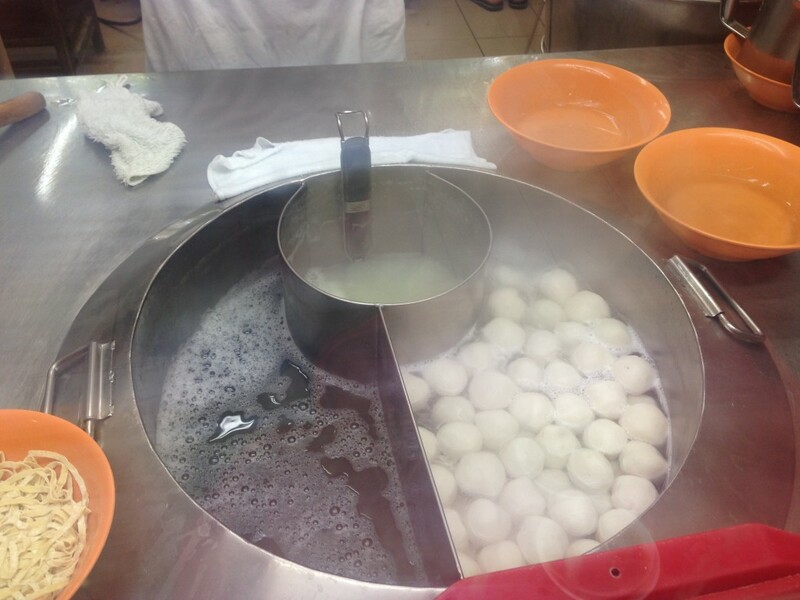 At the head of it, there’s a big boiling vat of soup filled with bobbing fishballs. The hawker behind the counter is a young man — in sunglasses, sporting a ponytail, no less. He’s all business back there, a whirling dervish of a guy — you can see this in this video I shot. This non-stop bundle of energy whizzes around, quickly boiling noodles, tossing various seasonings and sauces on them (love the wrist action as he does it to mix things up a little) before presenting you with a tray of noodles in spicy gravy with a bowl of plump fishballs on the side. I swear he takes less than 30 seconds to put together a bowl. How was it? Not bad, for SGD $3 (USD $2.40). The fishballs were fat ones, too, and tasted super fresh. I liked their firmness — nothing is worse than a squishy mealy fishball, really. As fishball noodles go, this was a good deal for the amount of food you got. 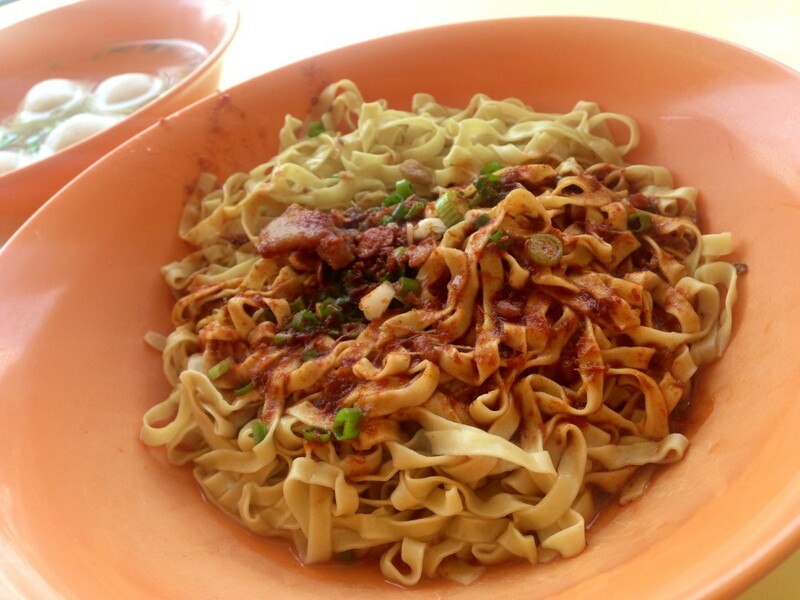 One thing, though — in most places these days, when you order Teochew-style meepok, the dish comes peppered with well-seasoned minced pork and sometimes pork balls. The meat-lover in me sorely missed that. But hey, if you’re not as much of a meat freak as I am, head to Meiling Market — you won’t be disappointed. 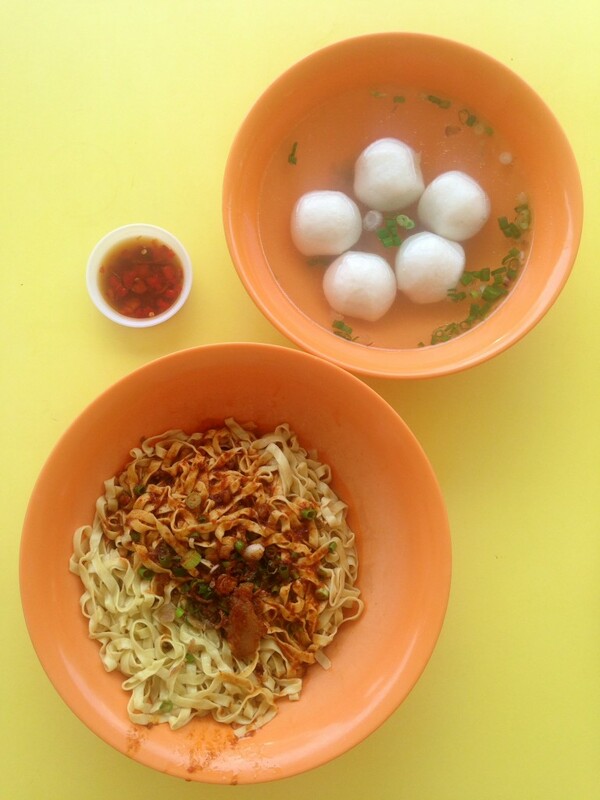 Xin Lu Teochew Fishball Noodles, Meiling Market and Food Centre, Block 159 Mei Chin Road, #02-05, Singapore; Tel. : +65.6475.8510; Mobile: +65.9771.8675.